Color My Conversation: My Review | My Journeys Through Life . . . Herding Cats In New Mexico! We have been blessed to receive for the purpose of this review a new to me program. It is called Color My Conversation, and it comes from the company Northern Speech Services. I have four children who each have their own unique special needs, but all four of the boys struggle with conversation in one way or another. My eldest “The Batman” who is developmentally delayed due to Fetal Alcohol Syndrome, came to us at the age of two. He has a lot of trouble with “getting” social cues when it comes to conversing, and tends to as a result, trap people into a conversation that they are too kind to walk away from. The same thing is true with “The Artist,” who came to us full-time at the age of six. Our twins, “Mr. Loquacious” and “The Puzzler”, who we came to us when they were age eight, both have severe trauma, and have trouble with carrying on a proper conversation as well. You can see in the picture above that this box came with a WEALTH of product, absolutely everything that is needed to use this program! We were just thrilled to see everything included, and I did not have to purchase a single thing! We already own a bicycle pump to inflate the ball (four boys, after all!) Once the ball was inflated of course, it couldn’t be kept in the box anymore, so I have had it up on a shelf. When we took it down to use though, “The Batman’s” therapy dog, Shiloh, thought it was for him, and followed along to where we were going, lol! Color My Conversation is meant to help when teaching people (not just children, as evidenced in my home) the language skills needed for face-to-face conversations. Using a multi-sensory teaching approach to help guide children (or special needs adults) through the conversation flow, by helping them learn to make their way through a conversation starting at a basic greeting and working toward the most complex conversation that the person is capable of having. This could be vastly different from child to child, to special needs adults. Using a multi-sensory, holistic approach becomes a fun, engaging way to aid in the development of social awareness, self-regulation, executive function, and other skills. The complete (again, EVERYTHING is included in the box when you receive it) program includes a lot of fun, interactive activities that help the participants learn how to start, maintain and end a conversation properly. Because this program comes complete with a comprehensive manual on CD and online lesson support videos, I was able understand how to implement this program to really help my kids be successful thus far. Color My World can be easily adapted to any room or group size or use with an individual student and over the period of time that works best. The inflated ball will be tossed (we also handed it to each other) back and forth to represent turn taking as well as to aid in the establishment of eye contact. Ribbon will also be used. Students will learn simple greetings & farewells (including body language/nonverbal communication), short and long conversations which include topics, comments, questions and topic changers. A Wall Display will start to be built to aid in representing the Conversation Path, and should remain up as a visual support for the children. Throughout the program, adaptions are given for use with those who have intellectual disabilities. Learning about earn about “WH” questions, Interrogative Reversal questions (i.e. Yes! No! Maybe So! ), making comments count, how to become a topic changer pro, and how to speak loud and clear. Worksheets, crafts, artwork, drill work and game activities are included for each lesson. Students will grow in confidence as they practice their use of the conversational features being presented and have an increased ability to have conversations on even more topics. 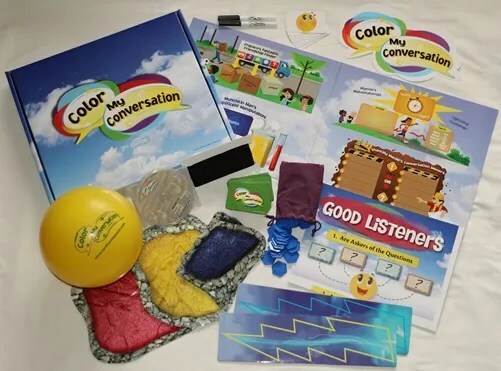 In the Advanced Level, ages 8 through 12, your student/s will be introduced to the multi-activity Color My Conversation Game when they will either actively play or observe and comment on those who are playing it. The purpose of this activity is to focus on improving a child’s ability to begin, continue, or close topics using appropriate topic transitions and turn taking strategies using the 2-sided multi-activity Color My conversation Game Board. The students will also practice taking the role of the main listener or main speaker. Finally, we have the Expert Level, which is for variable ages, including adult. It is intended for ALL ages, because it is intended to identify the conversational skills that each person is capable of using, and then support the transfer of those skills from the practice room to a real world setting. By practicing conversations in the “real world, you, the instructor, can also steer students into conversations that have not been addressed or have a need for more skill development. Conversation Path stones can be used with no writing, and may show drawings or symbols instead. Verbal instructions may be limited, using more exaggerated gestures instead. A more limited amount of topics, but using a higher level of repetition for each topic. Sentence strips can be used to support grammar and sentence structure. The Beading Activity will be used to provide a visual support for continuation of the conversations being taught. Enhanced use of the highly motivating and appreciated Color My conversation Songs. There are sample pages available if you scroll down on this page. This is a complete, in the box program. As I said I didn’t need to purchase a single thing to get started. at the price of $149.00, I think it’s well worth it when it comes to helping those who need it in learning how to better communicate. I think it is helping my kids, and will continue to do so! To read 39 other fair and honest reviews from the Homeschool review Crew about Color My Conversation from Northern Speech Services, please click on the banner below!